Jupiter is the largest planet in the Solar System and is named after the Roman king of gods. Jupiter's mass is more than the mass of the rest of the planets in the Solar System put together. Following a large orbit five times farther from the Sun than the Earth, Jupiter makes one rotation about every 12 years. However, it turns around on its axis very fast, creating a short day for Jupiter and giving the planet a slightly oval shape. Jupiter is one of the brightest objects in the sky (after the Sun, Moon, Venus and sometimes Mars) and a spectacular planet for observation. Read below to learn more about the Jovian atmosphere, interior, exploration, moons and rings of Jupiter. Jupiter has a giant atmosphere, which consists mainly of the lightest chemical elements, ammonia, water and sulfur which give color to the atmosphere bands. You can see the light white and yellowish bands, called zones, and the dark reddish brown bands, called belts, through small telescopes or binoculars. Tremendous winds with speeds greater than 400 miles per hour blow in opposite directions in neighboring bands creating hurricanes within the border between the bands. Jupiter, like the rest of the giant gas planets, has no solid surface under its thick atmosphere. However, because of high pressure, hydrogen reaches the liquid state around 10,000 miles below the top layer of the atmosphere. Moving towards the core, the pressure increases so much that hydrogen reaches the metallic state. Scientists think that Jupiter has a relatively small rocky or metallic core with a mass 10 to 15 times greater than the Earth's. Spacecraft missions have revealed interesting facts about this giant planet and its satellites. Jupiter was first visited by Pioneer 10 and 11 in 1972 and 1973. Later in the late 1970s, Voyager 1 and 2 passed around Jupiter. However, only Galileo's mission was fully devoted to the exploration of Jupiter. This craft sent back valuable information about the planet's ice covered satellites Europa, Ganymede, Io and Callisto. 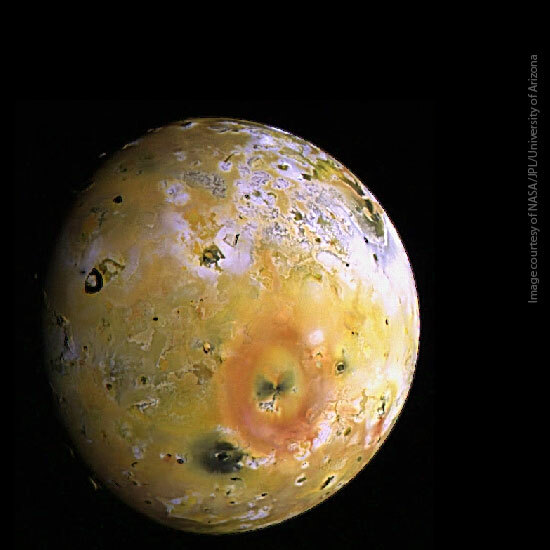 It took amazing pictures of Io's active volcanoes. Galileo also sent a probe into Jupiter's atmosphere to gather atmospheric data and record Jupiter's powerful thunderstorms. Eventually, when Galileo ran low on fuel in 2003, scientists intentionally crashed it into the atmosphere to avoid contaminating Jupiter's satellites or creating more space junk. According to recent discoveries Jupiter has 63 satellites, however only 16 of them are considerably large. Voyager 1 also registered a faint ring system around the planet, which is difficult to detect with Earth based telescopes. A planetary "ring" is made up of small particles of dust or ice which orbit a planet. These particles are sometimes left over from the formation of the planet. They were too small, or too close to the planet, to stick together and form a solid satellite. Instead, they spread out into a ring, like a hula hoop, which surrounds the planet. From studying the images of Jupiter's rings, scientists now know that the rings are also made up of particles which have been thrown off of the tiny inner satellites. The main ring is made up of dust from Adrastea and Metis, and the outer gossamer rings come from Thebe and Amalthea. In 1994, astronomers were able to observe a very rare and spectacular astronomical event: the comet Shoemaker-Levy 9 passed close to Jupiter and was split into 21 pieces by The impacts of these large fragments caused great explosions. Debris from these explosive impacts formed a dark haze in Jupiter's atmosphere. If a similar comet collision occurred with the Earth, it could create a dark haze that might block sunlight killing most or all life on Earth. The Great Red Spot, probably the most remarkable feature on Jupiter, is a giant storm with an oval shape, twice the size of the Earth. It has been observed for the last 300 years, but may have existed ever longer. Scientists are puzzled about how such a big storm could be stable for so long. Hydrogen reaches the metallic state at pressures four million times greater than the atmospheric pressure at sea level. Metallic hydrogen consists of ionized protons and electrons. It has high electrical conductivity which when combined with fast rotation around the axis drives the powerful magnetic field of Jupiter. Jupiter is so big that a thousand Earths would fit inside. The amound of matter in an object, measured in kilograms. Mass is different from weight, which is measured in pounds and can only be measured under acceleration such as a gravity field. 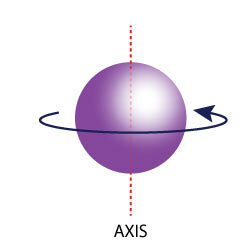 A 1-kilogram mass weighs about 2.2 pounds on the surface of Earth, but weighs only 0.8 pounds on the surface of Mars. The eight planets and corresponding moons, as well as various astronomical objects all of which orbit the Sun. A colorless gas and a compound of nitrogen and hydrogen. A yellow, non-metallic combustible element used in the preparation of sulfuric acid and other compounds. The most common element in the Universe and the main fuel of stars. Launched on March 2, 1972. The first probe to successfully make the trip through the asteroid belt and to Jupiter. 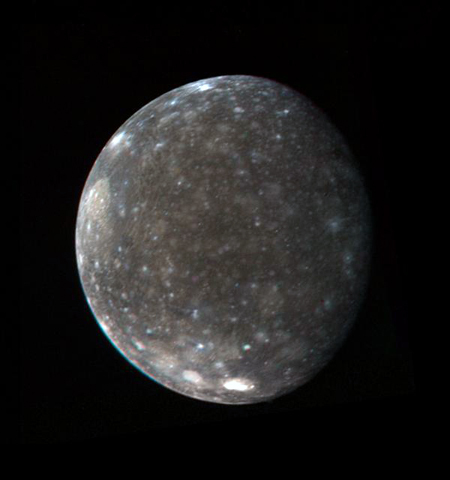 Launched on Arpil 5, 1973, Pioneer 11 also made it to Jupiter and sent valuable images of the Galilean moon, Callisto. Using Jupiter's gravity, it then changed trajectories and headed towards Saturn, from which it sent images of the giant planet's moons and rings. A spacecraft launched on September 5th, 1977 by NASA to explore the Solar System and fly by Jupiter and Saturn. In the event it is ever found by an alien civilization, Voyager 1 carries a gold-plated copper record with music, sounds, images and diagrams from Earth, designed in part by Carl Sagan and Frank Drake. 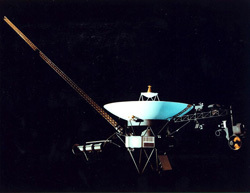 Currently, Voyager 1 is in the outer edges of the Solar System and is still in operation. The smallest of Jupiter's four Galilean satellites, it was discovered in 1610 by the Italian astronomer and mathematician, Galileo Galilei. It is believed that there is a deep layer of water underneath its icy surface. 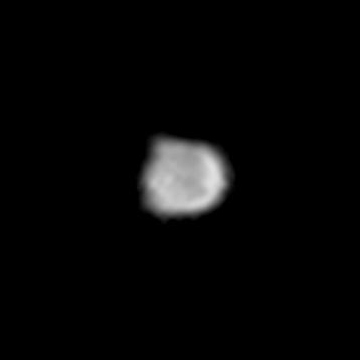 One of the four Galilean Satellites and the largest moon in the Solar System. Discovered by Galileo Galilei in 1610, it has a radius of 2,634 kilometers. 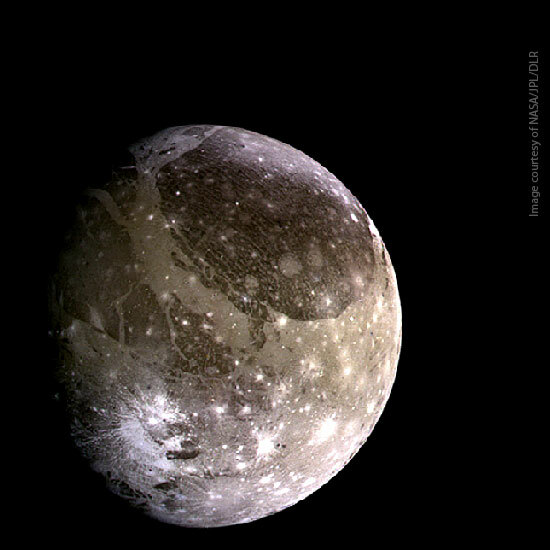 One of the four Galilean moons, and the fourth largest moon in the Solar System. Discovered by Galileo Galilei in 1610, it has a radius of 1821 kilometers. 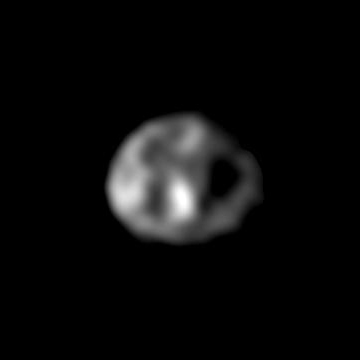 One of the four Galilean satellites, and the second largest of Jupiter's moons. It was discovered in 1610 by the Italian astronomer and mathematician, Galileo Galilei. Jupiter's second moon, discovered in 1979 by David C. Jewitt and G. Edward Danielson from Voyager 2 photographs. It measures 20 x 14 x 16 kilometers. The innermost moon of Jupiter, discovered in 1979 from photographs taken by Voyager 1. It measures 60 x 40 x 34 kilometers. One of the moons of Jupiter, discovered by Stephen Synnott in 1979, from photographs taken by Voyager 1. It has a size of 116 x 98 x 84 kilometers. Jupiter's third moon, discovered in 1892 by Edward Emerson Barnard. It measures 250 x 146 x 128 kilometers. An ice-rock body composed of ice and nonvolatile dust, constituted mainly of frozen water or gas. Comets typically have five parts: a nucleus, a hydrogen cloud, a coma, a dust tail, and an ion tail. A comet discovered in 1993 by the American astronomers Carolyn and Eugene Shoemaker, and the Canadian astronomer David Levy. 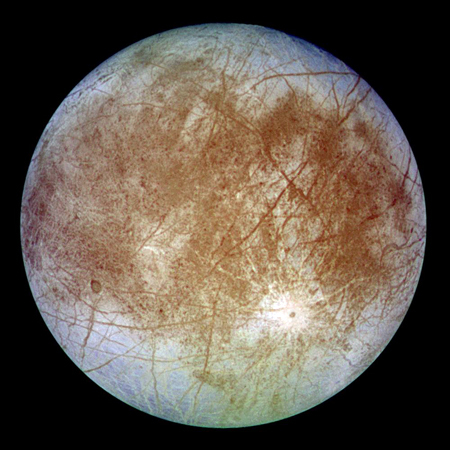 It is best known for breaking up and crashing into Jupiter's surface in 1994. Description Jupiter as seen by Voyager 1 early 1979. Each image was taken every Jupiter day, or every 10 hours. Description Comet Shoemaker-Levy 9 crashing into Jupiter, as seen on the lower left.